I have written before about an early set of fantasy wargames rules (Royal Armies of the Hyborian Age) before but they are not the earliest set of specifically fantasy wargames rules I ever saw. I know I have been wargaming since at least 1978, but I was interested earlier than that. It may have been seeing the book “Know the Game:- Wargaming) or not, but I got that earlier, I know that because my Dad bought it for me. You can find pictures of the cover and some of the internal passages in this blog post about Phil Barker here. In later life finding out about Phil Barker’s reputation explains why I found that booklet a bit hard going. 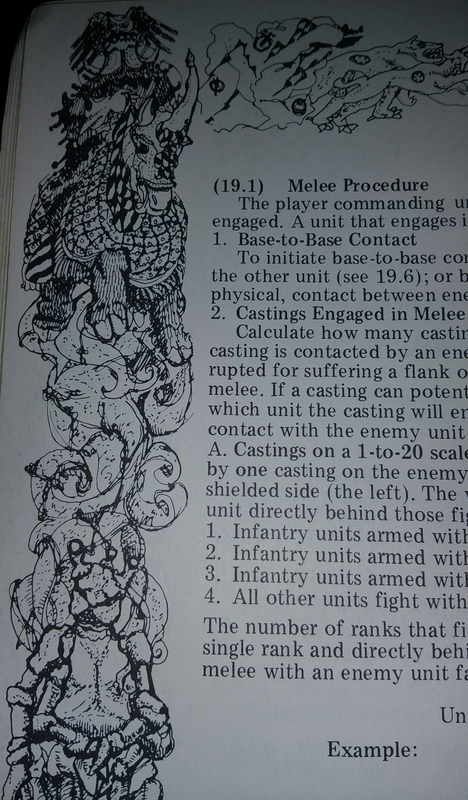 The kind of game I saw, where normal troops were supplemented by summoned units, creatures and angelic/demonic spirits is not a style I can remember seeing in the last 30 years. Firstly Tolkien derived troops became the norm, or at least faction based (like Warhammer Fantasy Battles, Fantasy Warrior, Wargods of Aegyptus or Kings of War) and the demons and monsters started on the field as part of the army troop selection. In TET, almost you could wish for is in there. Normal troops, heroes, leaders, gigantic mounts, monsters, trolls, giants, shape-changers (It’s the only ruleset off the top of my head that lets you model the forms of Beorn consistently in itself) , flyers, war machines, different sorts of magicians, powerful magic that could backfire on the caster and which is affected by the hour of casting the spell. You don’t get rules on deployment, so deployment advantage powers aren’t part of the game. For the era it was a well produced book. The text is across the page rather than being put into columns, there are illustrated examples, though some of the “uninvolved figures” represented by hollow circles, are a bit hard to make out, and there are the intricate borders all around the pages. There are four designs, used in the same sets of two, sometimes flipped around. 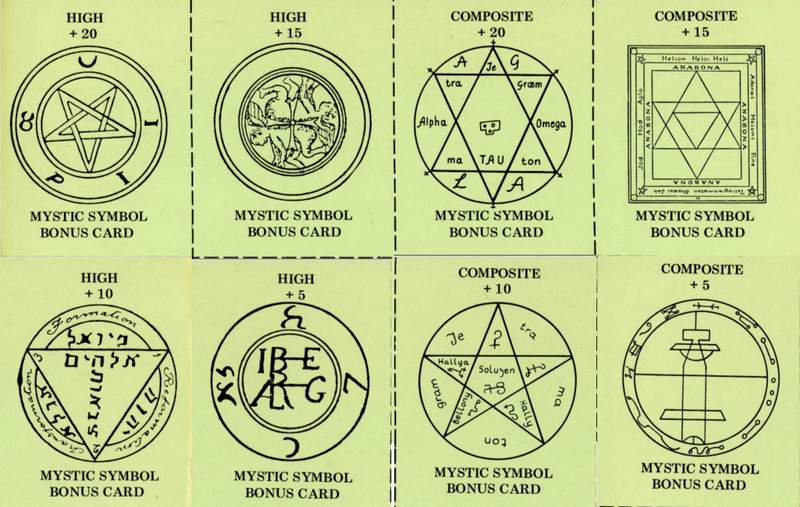 One strange thing is that the magic cards, essential for using the range of ceremonial magic and summoned entities, was not always sold with the book, they cost extra, which seems strange. There were also some blank or indistinct pages in my copy, which seems to have been a common enough problem for pdfs replacements to have spread around gamers. The set-up and mechanics are a lot different to most current fantasy wargames. The basic formations and maneuvres are ones that will be familiar to people who play historical wargames, particularly black power era ones, as your units can form line, column, wedge, skirmish line or square. The illustrations show four figures to a stand or multibase which is a suggestion for making moving figures easier as four is just the basic width for column, or in the wedge example above, each line has to have at least 4 figures more than the one before. That stand is not the unit, the unit can have multiple stands and they rules suggest leaving a few figures unmounted to make removing casualties easier. Moreover, the base size for a figure is not the same for each figure of the same species. 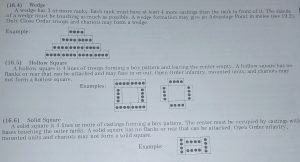 The formation that the figure will be used in determines the width, as does the height and weight of the thing that the figure represents, this will mean that two lines of the same width, one of close order infantry and the other open order infantry of creatures of the same size, then the close order infantry will have twice the number of figures in the fight. The close order human has a suggested width of 15mm, which is another sign of the age of these rules, when 25mm was 25mm, and wargames figures were often in profile. Trying to fit heroic 28mm to the same size would be hard. There are rules for changing formation, with less well trained or motivated units taking longer to shift formations , and only the best trained units able to do the more complex maneuvres. The advantages of a formation are missing or abstracted in a current fantasy wargame like Kings of War, eg a pike or spear unit cannot form a defensive formation with all the spears outward with a movement penalty the usual price. 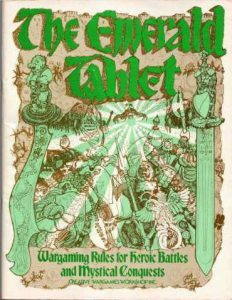 However any ruleset has to try and strike a balance between “realism” and “playability”, between “simulation” and “game” and most fantasy sets try to be quicker, fun games rather than all day Kriegspiels. Another difference that stands out from something like WHFP or KoW is the issuing of orders. 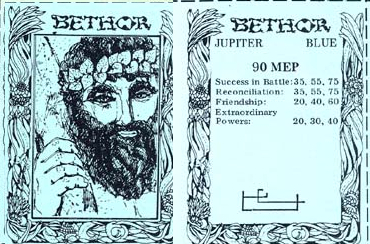 Many games have restrictions using mechanisms like limited command points, random card draws or push your luck dice rolls, but in TET they use the old idea that all units have one written order that they must follow, and it requires intervention from a Commander or Sub-commander, directly or via message (carried telepathically or by an actual messenger). The idea of point designing units from scratch is old-fashioned these days. It is much more common to only give a limited set of types for each faction, with minimal customisation. Sometimes this is argued from a point of balance, but mostly it seems to be to give the company a great deal of control over their game after the purchase of the rules, and to give scope for selling new troop types and the figures to use for them later on. This is not just true of fantasy and science-fiction games, it seems to be quite common in big company historical games too these days. The closest I can think of, from the top of my head, for the idea of designing your troops from a base set of stats to which you add characteristics, and then assembling your army is Crusader Miniature’s “Legions of Battle” (derived from their Crusader Miniature rules and illustrated with Mantic figures). 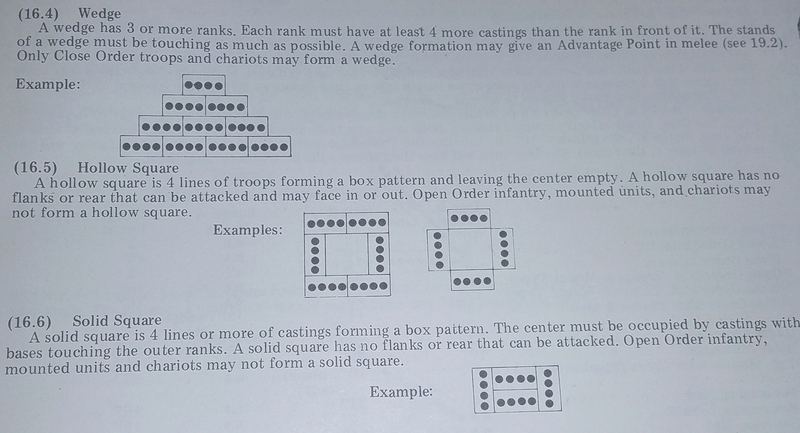 Unlike “Legions of Battle” though, whose troops design is simple and lot of fun, designing units for TET is complex and it’s useful if you have a calculator handy. So a unit of 10 halfling soldiers costs 20 points, the dwarves 50 points. As you design this then you are going to have to note various levels of ability, like level II leadership, on your notes as this is going to have an effect in battle, as you total up all the advantages in height, weight, reach, leadership etc that your units involved in the melee have. There are 25 categories of advantage including how fatigued your unit might be, and some advantages are cancelled out by circumstances, e.g you get no advantage for the longer weapon if you were just forced back in melee. Like a lot of wargames of that era, combat is a matter of finding out how many casualties are caused and the first stage of that is how many figures you have involved in the fight, basically it is number of figures touching base, plus some overlap, some from the next ranks if they have a long reach weapon like a spear or pike, the longer the reach, the more you count. There are other circumstances that can affect the combat, the strength of heroes or if a unit has a significant height/weight advantage over the enemy, then each figure in the bigger side counts as four for the purposes of the combat. You then use your advantage number plus number of figures involved to obtain a number to which you had a d20 roll divided by 100. With me so far? 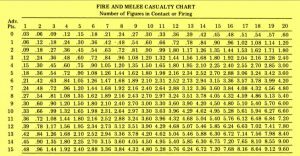 Any whole number is that number of automatic casualties, any number after the decimal point is the percentage chance of another casualty, so 3.34 would be 3 automatic casualties with a 34% chance of a fourth. It works, but battles with this would less need a chess clock than a chess calendar, and it does not have the visceral appeal of buckets of dice. Complex as they are, the combat rules work, even if they do drill down to the detail of what happens to draft animals when enemy units touch them (spoilers, they die), when do gigantic war mounts stampede, what areas does a breath weapon cover and what angles war machines can fire at to hit flying targets They are at core standard style wargames rules of the era, and could be used for battles from Ancients to Renaissance, perhaps even Napoleonic with some house rules, but the authors have given thought to the effects of the fatntastic on the mundane, e.g what happens when a fire elemental causes casualties to a bombard, you check for it exploding of course. It is the magic that make this set of rules different from anything else I can remember reading or seeing played. If the unit creation, movement and combat rules seem fiddly, well at least they cover familiar territory for the wargamer. Magic is split into “Innate”, basically spells cast from the powers of the mage, and “Ceremonial”, rituals to summon powers of the Astral plane. The innate powers are somewhat limited in scope to the mage, such as levitation or invisibility for the big powers you need to summon and command astral beings. Magic costs power, called Magic Endurance Points, successfully cast or not, and the more powerful (and expensive) the mage then the more of these they will have. Probationers, the lowest grade of mage, have only one innate power, Combat, but can assist more powerful mages in Ceremonies. High Magicians can summon Angels or Olympic Spirits, Theurgist can summon Demons, Thaumaturges can summon all types. So why would you want to summon astral beings, purely as bigger monsters for combat? No, particularly as you risk madness or the loss of your powers. The summoned beings have powers that can be directly used in combat, yes, but they have powers that can affect the environment of the battle and outcomes of fights. The cards for the astral beings list the powers that each has, e.g . The Demonic King Beleth can create troops or cast the spell of Friendship (congrats, that enemy unit works for you now). Summoning astral beings requires the mage and up to two assistants to create a circle of evocation. The hour of summoning can be significant, adding to the chance to summon, so if using evocation in a battle then you will have to roll to find out when the battle started, and there are four game turns to the game hour. 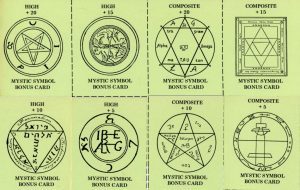 Moreover, Angels and Olympic Spirits have associated colours, and if your mage figure is painted in colours corresponding to that colour, then congratulations, you get another summoning bonus. For demon summoning then sacrificing intelligent beings increases your summoning chances. Sacrifices are a resource that need to be escorted by your apprentice mages, so your enemy could lower your chances by targeting your apprentices. Astral powers are beneficent (aid a unit) or klipothic (harm a unit or create enemies) and include summoning elementals (eg an Air Elemental can disrupt or damage a unit), sewing discord (causing units to disobey orders), improve morale, directly affecting success in combat and more. When casting your powers you roll d100, the higher the number then the greater the effect, so if casting Creating Troops then the higher the roll the more points to spend and the types you can choose go from Open Order Infantry, through Close Order then any. Heroes and figures in casting circles have innate magical protection against harmful powers but if you want to protect your troops then you might want to invest in magic amulets for the figures in your units. So. Is it playable. Yes. It’s been a long time since I used these rules but they are certainly playable? Would I play them? No. The state of the art has advanced in 40 years and rebasing figures to the irregular sizes demanded by this system would be a pain. One of the considerations in a set of wargames rules has to be “do they feel right”. Do the results seem believable. 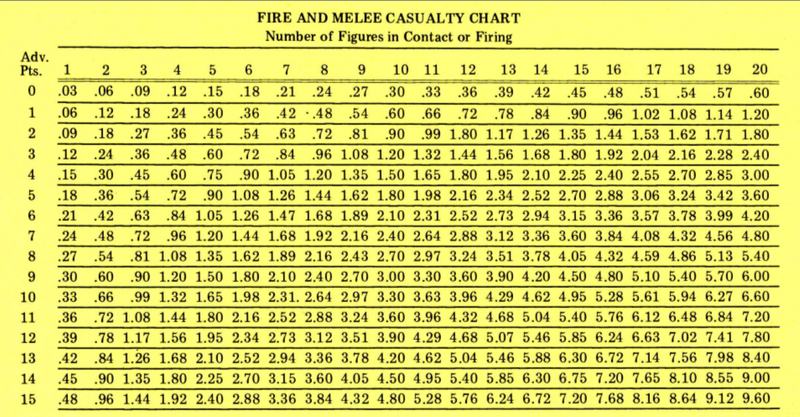 It used to be thought that this demanded exacting complexity to model every facet of a battle, but various designers have found that you can abstract elements of a battle out without losing believable results. Cavalry charging pike get roughly handled, artillery can decimate blocks of formed infantry, cavalry and infantry can overrun artillery. The streamlined rules work and you can still have flying troops and fear causing horrors. These days I would rather play Kings of War for mass battles, or Lord of the Rings for skirmish, though I have thought about adapting the magic concepts to Legions of Battle. In fact, before Legions of Battle was published, I had written almost all of a Dark Ages fantasy adaptation of the Crusader rules, I like them that much, but it’s nice to remember sometimes where you came from. 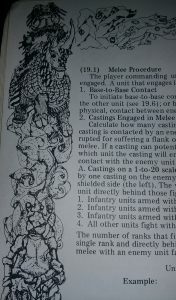 This entry was posted in RPGs & Wargaming, Wargaming, Wargaming. Bookmark the permalink.